I rarely make cheesecake, significantly due to the high calorie from each bite of it. However, the cheesecake craving usually jumps into my daily abstemious food portion at least once a week. That’s why I have to find a way to loose some part of the cream cheese in the cheesecake ingredients, certainly because of the calorie lowering demand. The consuming of this new version Japanese cheesecake went up quickly right after the cheesecake had gone out from the oven. 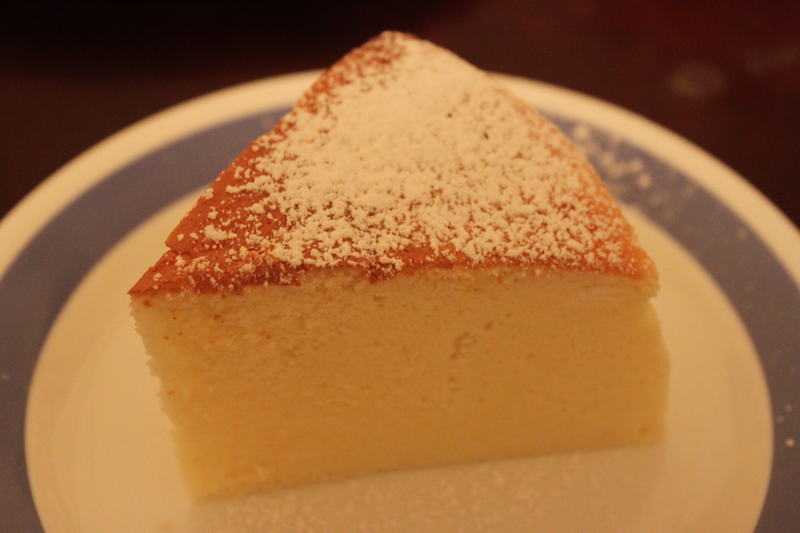 There’s no need to be verbose in describing Japanese cheesecake. 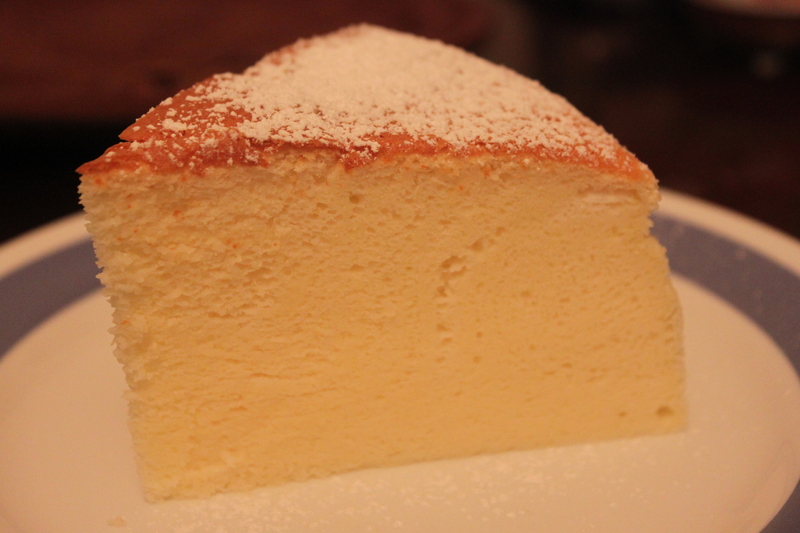 That cake is softer and lower in calorie than the original cheesecake due to the egg white increase and the cheese decline in the cake’s structure. But I still wanna reduce more cream cheese to satisfy my cheesecake craving. Yogurt can be a good substitute for cream cheese if you know how to use it. Of course, the yogurt’s structure differs from that of cream cheese then many amateur bakers ( similar to me ^^ )feel hard to deal with yogurt in cheesecake baking. My experience is to choose the best store-bought plain yogurt and drain it overnight before using. The yogurt therefore would be no soggy but firm enough to be ready for subbing the cream cheese in this cake. In this recipe, I cut down half the normal cheese required, replaced it by drained yogurt. Because of the significant reduction of cream cheese, the corn flour would be doubled to make the cake more sturdily. The yogurt flavor definitely would be more delightful than that of the cream cheese. – In a double boiler, melt cream cheese, butter, milk and 30g sugar. Stir until they are smooth then take it out from the boiler. – Add the yogurt and stir well til combined. – Add the flour mixture. Use a whisk to fold the flour until it disappears. – Gradually add the egg yolks and stir until everything is incorporated. – In a clean bowl, beat the egg whites at low speed until it’s frothy then add the cream of tartar. – Beat the whites at speed 2 while gradually adding sugar. Beat until the whites reach stiff peak but not dry. Note: you should stop beating as you see the beater is raised. – Gently fold the beaten whites into the cheese mixture. Pour the mixture into the pan. – Steam bake for 1 hour at 300F (150 C) at the lowest rack of the oven. – Let the cake sit for 20 minutes before take it out from the pan. Serve: you can use the cake when it’s cold or even when it’s warm. I prefer the warm cake with a cup of black coffee. This entry was posted in cake, dessert, Japanese and tagged cheese, cotton cheesecake, dessert, japanese cheesecake, yogurt. Bookmark the permalink. có sữa bạn ạ, lúc quay mình thiếu đoạn đó. Drained yogurt chỉ đơn thuần là dùng plain yogurt lọc cho hết nước thôi, bạn để trên strainer qua đêm là được. Hi, this recipe is for what size of mould? Hi, Do you cool down the cheese mixture before adding the egg and flour mix?